It is a tuber with regular shape, the dimensions are very variable and can reach also big size. The weight can vary from a few grams to a kilo or exceptionally more. The surface is smooth, finely grained, ocher color, sometimes tending to yellow-green. It is symbiont with oaks, limes, poplars, willows and rarely with hornbeam and hazel. Mature from late September to early January. These tuber have dark warty rind with prominent warts, clear pulp (light brown) and slender veins anastomosed. They are well on limestone soils. It is symbiont with many plants, both deciduous trees (oak, hazel, beech, hornbeam) and coniferous (pine, cedar, fir). Mature from end of May to December. Moraiolo is the most widespread cultivars in Umbria and is not a large olive tree. It is characterized by having the main branches and direct fruiting branches, which rise in a characteristic way. The olive is medium sized, with rounded shape and is pulpy and very rich in high quality oil. Its productivity is remarkable and also constant. It resists the cold and loves positions a bit ‘high. Moraiolo gives an oil medium intensely fruity, with green and herbaceous notes. The taste is intense with sensations of bitter and spicy higher. In Umbria is present in all olive-growing areas, especially in the new plant. Frantoio is among the medium-sized trees. It is characterized by having the main branches very winding and sloping and children typically pendulous branches. Its olives are rather large and rich in pulp, with oval in shape and large top quality oil content. Its productivity is constant and has an average capacity of resistance to cold. Characteristics: medium fruit of unripe olives, rich and wide, bitter and spicy, with clear hints of leaf, artichoke, fresh vegetables, marjoram and a balsamic note reminiscent cypress. The flavor is fine crop, with spicy notes and especially bitter, and flavor of lettuce, celery and fresh almond on the finish. In Umbria is present in all olive-growing areas, especially in the new plant. Leccino has very powerful gait with wide canopy. It is characterized by the performance of the tilted main branches and sub-branches. The fruit is fairly large and fleshy, with ovoid-cylindrical shape and good wealth of high quality oil. Its productivity is good but perhaps less constant Moraiolo. It is highly resistant to the cold. organoleptic characteristics: fruity from light to intense of fresh olives, with hints of grass and herbs notes, in particular of mint and basil. The taste is slightly bitter and spicy, with a vegetal flavor of lettuce, chicory, artichoke and sweet almond on the finish. The San Felice is located in the hills and foothills of the Spoleto area and the lower Valnerina. Synonyms: Dritta(Marchionni et al., 1999), San Felice Dolce. The San Felice, specific variety of the DOP area of the Martani mountains, makes an important contribution to the quality of the olive products. Like plant ensures average cold resistance, is highly productive and the oil that you get good content in anti-oxidants. The plant is medium-sized and medium-sized olives. Oils characterized by a medium level of fruitiness, bitterness and pungency, with predominant scent of fresh almonds and read sensations of grass / leaf and artichoke. “Sagrantino di Montefalco” the day October 30, 1979 obtained the DOC and 5 November 1992 the recognition of the DOCG. The Montefalco Sagrantino DOCG or Sagrantino di Montefalco DOCG takes its name from the grape from which it is produced. Cultivated for centuries on the slopes of the hills of Umbria, Sagrantino is considered autochthonous, although there are various hypotheses regarding its origin. Some, in fact, they consider it of Spanish origin, others believe it was imported by the first Franciscan friars, still others introduced in Italy by the Saracens. This DOCG contributes largely to the blessings obtained by the Umbrian region as a producer of fine wines, already known and consumed in the Renaissance popes and the governors. Production area: the entire territory of the municipalities of Montefalco, Bevagna, Gualdo Cattaneo, Castel Ritaldi and Giano dell’Umbria located in the province of Perugia. Aging period: at least 30 months, of which at least 12 in wooden barrels. The vinification and aging processes must be done within the municipalities included in the production area. It ‘a wine of great structure made exclusively from Sagrantino grapes. Thanks to the rich collection of polyphenols and tannins, this wine has an extraordinary longevity. therefore it requires a long period of aging in wood first, then in the bottle. Serve with: grilled meats with brown sauces. Homonymous grapes you also get the traditional raisin. The grapes are carefully selected and made them simmer on racks for at least two months. So it makes wine by fermenting the must with the skins. So you get a very special dessert wine because, despite being a sweet wine, remains dry thanks to its tannic heritage. Serving suggestions: meditation wine, it goes with seasoned or dried sweet cheese. The DOC Montefalco has been recognized on October 30, 1979. Grapes: Sangiovese and Sagrantino 60-70% 10-15% with the addition of other non-aromatic red grapes for a maximum of 30%. Production area: the entire territory of the municipality of Montefalco, Bevagna, Gualdo Cattaneo, Castel Ritaldi and Giano dell’Umbria located in the province of Perugia. Ageing period: 18 months. For the Rosso Riserva becomes of 30 months. Serving suggestions: pasta dishes, roasted and grilled meats, poultry. Serving temperature: 16 ° C.
Grapes: Grechetto for at least 50%, Tuscan Trebbiano for 20-35% and may possibly contribute to the maximum of 15% grapes from other vineyards. The aromas and tastes conferred by Grechetto, is accompanied by the note of freshness typical of Trebbiano. 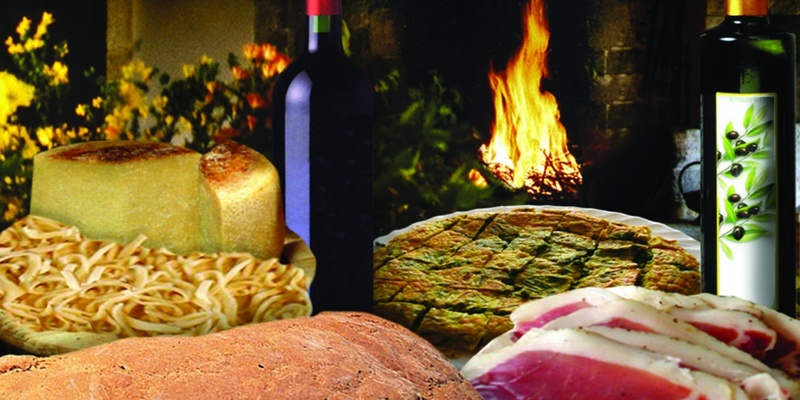 Food pairings: light appetizers, soups and dry, fish and white meats. Giano dell’Umbria falls within the production area of the DOC Colli Martani wines. The territories of the Tiber left are rich in testimonies of the activity wine in the area, by the Etruscans and Romans before then. The local wine is particularly remembered for the good attitude to the long aging. Renowned for the production of wine since Roman times (talk about Marziale and Plinio il Vecchio) this area, which includes a large area to the northeast and to the southwest of the ridge of the Colli Martani, is rapidly qualitative ascent. The production, unlike in neighboring areas focuses on single-variety. Many manufacturers expand their range with these wines. Grapes: Trebbiano 85% minimum, Spoletino Trebbiano, Grechetto, Malvasia bianca di Candia, Malvasia, Garganega and Verdicchio, alone or together, up to a maximum of 15%. Production area: The grapes used to produce wine “Colli Martani ‘must be produced in the area that includes the entire territory of the municipalities of Gualdo Cattaneo and Giano dell’ Umbria and part of the territory of the municipalities of Todi, Massa Martana, Monte Castello di Vibio, Montefalco, Castel Ritaldi, Spoleto, Bevagna, Cannara, Bettona, Deruta and Collazzone. Taste: dry, tangy, distinctive and order. Serving suggestion: Accompany a pasta with fish sauce, chicken salad, fried vegetables. Grapes: Grechetto for at least 85%; Trebbiano, Spoleto, Malvasia and Malvasia di Candia, Garganega and Verdicchio, alone or together, up to a maximum of 15%. This wine can be designated with the sub-denomination geographical ‘Todi’, if made exclusively from grapes produced in the town of Todi. Aroma: aromas slightly vinous, delicate and characteristic. Taste: Dry (slightly sweet), velvety, slightly bitter aftertaste, fruity, characteristic, harmonious. Pairings: it goes with hot starters and first tasty regional dishes such as rigatoni charcuterie. Grapes: Sangiovese minimum 85%; Canaiolo, Ciliegiolo, Barbera, Merlot, Montepulciano up to a maximum of 15%. period of aging: this wine can not be consumed without first undergoing a mandatory aging of 1 year. If you have an alcohol content of 12 ° and is aged for two years, of which at least one in oak barrels, can use the qualification Reserve. Taste: dry, harmonious, slightly tannic and pleasantly bitter. It has characteristic hints of red fruits and delicately herbaceous. 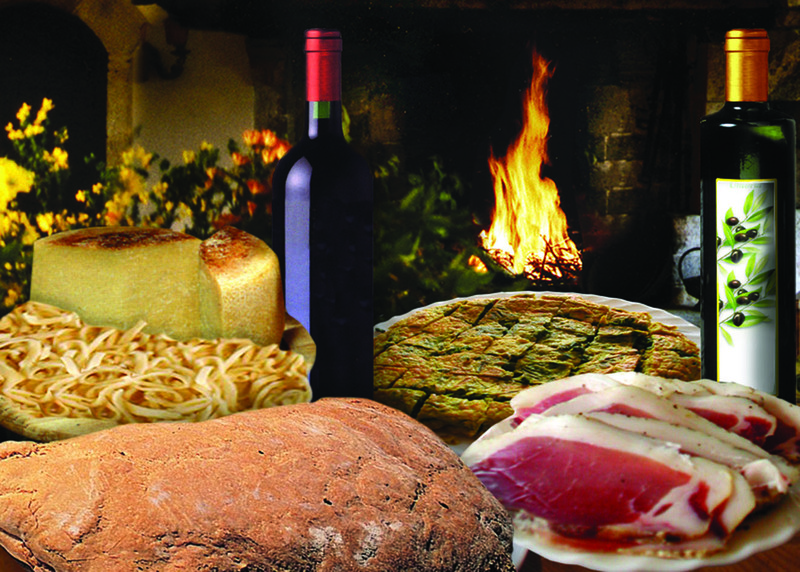 Serving suggestions: serve it with baked pasta, polenta with pork ribs Umbrian aged cheeses. Saffron is a spice aroma unique and intoxicating. It generally grows in mountainous areas to 500-700 meters s.l.m. with average rainfall in the winter and a dry summer, it prefers sandy-loam soils and has a ‘very good resistance to cold. The spice originates from bulbs-tubers planted in August. By the three red stigmas of the flower, which was born from mid-October until the end of the month, you get the saffron spice. Early in the morning, when the flowers are still closed, they collect and immediately proceed with the “withering” which consists in removing the three stigmas from the flower which then will be dried. Saffron, among other properties, fights aging thanks to its antioxidant properties, it helps the digestive system and stimulates the metabolism.